If you read my previous article on the two fly setup, you’ll now know the most popular two fly setup options available. You may be wondering when and where you might use these though. The simple answer is anywhere that the regulations will allow you. However, there are a few setups that are tried and true options that can help increase your odds of hooking up with that next fish or two. You may have an idea of what this two fly setup option is already. Basically you take a larger dry fly, i.e. 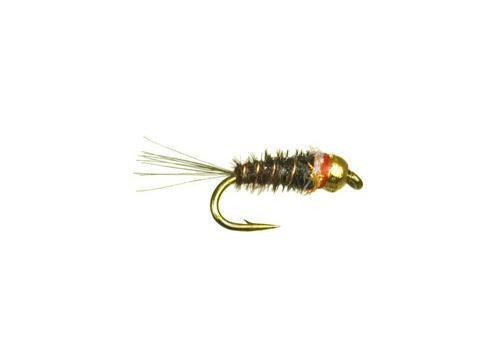 a hopper or other attractor pattern, and attach this fly as your first fly (either from the tag end, as point fly with a length of tippet attached to the bend of the hook, or by attaching a length of leader to the eye of this fly). Below that pattern you will attach some sort of a nymph, be it a hare’s ear, pheasant tail, or any other sort of nymph pattern. This setup gives you a larger attractor style dry fly pattern that fish instinctively try to attack first, but if they choose to turn away at the last minute they are presented with a subsurface nymph patter that they may be more inclined to take. You get two chances here! While this tandem fly setup is called the hopper/dropper setup, don’t let that fool you. 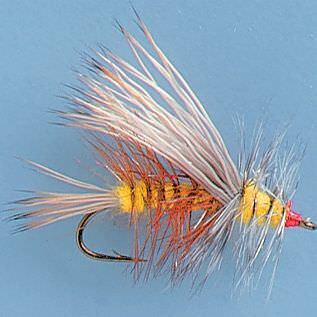 I also consider this option as one where you can fish a standard dry fly and nymph pattern. It works the same way…the flies are the only difference. One of the lesser-used two fly setup options is attaching two dry flies. This setup can be attached to your leader in any way that is preferable to you and there are many options as far as flies go. One favorite is to attach a larger attractor style dry fly and then a smaller more imitative style fly. This gives you the benefit of possibly inducing a strike to the attractor fly or if the fish decides against that there is another option that my resemble something that looks a bit more like a natural food source. One added benefit of this two fly setup is that if you are fishing the larger attractor/small natural setup, the attractor fly can act as a strike indicator. This works especially well when your natural fly is an extremely small midge or other mayfly imitation that are almost impossible to see. Add to this those times when the fish are rising but you just can’t figure out what they are feeding on. 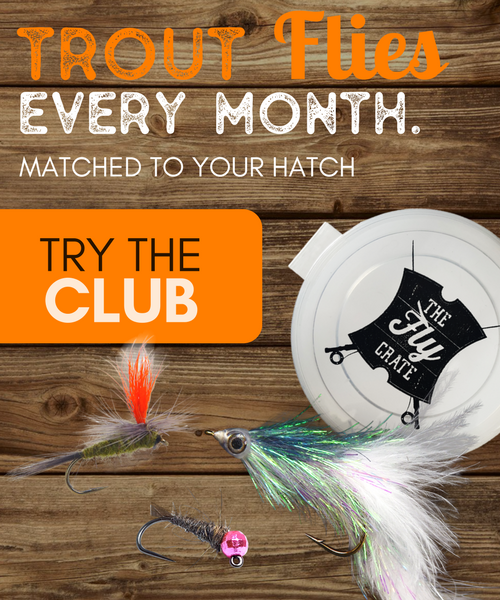 Attach two different dry fly imitations that you think might work and this will allow you to cover more bases to find out what those fish are feeding on. 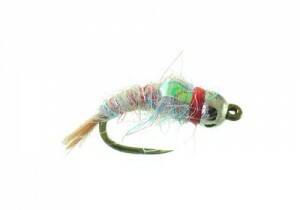 The two fly setup involving two nymphs is a tried and true option used by anglers across the world. This is also one of my personal favorites. You can rig this up as with any other of the two fly setups discussed previously. Just make sure you are comfortable fishing it. All you need to do is decide on which two nymph patterns you want to use. That can be the hardest part of this setup. 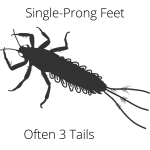 You can fish two larger nymphs and go for more of an attractor style setup or if there is an abundance of larger stoneflies in the water you are fishing. Or you can choose one larger pattern and attach a smaller midge behind this to cover a broader spectrum of food the fish might be keying on. The possibilities of nymph setups are almost endless. A favorite setup of mine involves using two patterns created by Lance Egan. I’ll attach a tungsten surveyor pattern and a frenchie to my line and have had great success with this. One other key point to make has to deal with the depth at which you want to fish this setup. Your flies can vary greatly in weight and you can use this to your advantage. For instance, you approach a spot in a river and notice that it is a fairly deep run. You might be able to see the fish in the water, but possibly not. 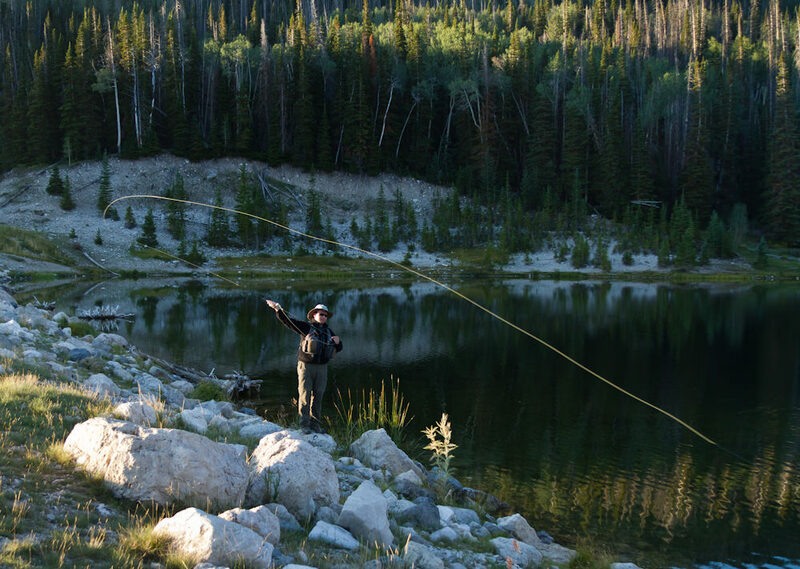 How do you determine what depth you should be fishing your flies? This is where the two fly nymph setup can work wonders. Start off by choosing two flies, one lighter and the other a heavier one weighted by a lead wrapped body and maybe even a tungsten bead. Depending on how you prefer to fish you two flies (tag end, eye of hook, bend of hook) you will want to set this up so that the heaviest fly is the very bottom one and the lighter fly will be above it on your line. So if you are using the tag end method, your lightest fly will be attached to the tag end as the dropper and the heavy fly will be on the bottom as your point fly. What this effectively does is allows your heavy fly to sink to the very bottom of the run and your lighter fly attached above this will be anywhere from a foot to two or three feet above it in the water column. That way you are fishing multiple depths in the water and covering any fish that may be on the bottom or suspended in the water column. Can you see how much more effective that is than just fishing at one specific depth? It works wonders! On the flip-side of that is attaching your lighter fly so that it is on the very bottom and your heavier fly above it. What this does is just the opposite of the above setup and works well when you know where the fish are sitting in the water column. Your heavier fly sinks both of them to the desired depth and allows for both flies to be fished at that desired depth. So if the fish are all tight against the bottom, use this two fly setup and it will allow you to present a very light fly deep in a run or pool that you normally wouldn’t be able to reach. This one may come as a surprise to many. Who would ever think about a streamer and a midge in the same instance? It works though. The basic idea behind this is that some food sources that streamers imitate feed upon small midges. So why not imitate that? First off, select your fly patterns. This can be a fairly arbitrary decision and I prefer to use flies I feel confident I can catch fish on. A simple selection of a black or brown woolly bugger and a zebra midge tend to work wonders. In using this setup, I would avoid the option of attaching to the eye of the hook. That option tends to have your fly sit at an odd angle. 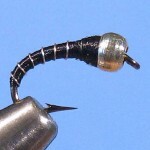 Try using the option of attaching to a tag end or by the bend of the hook. 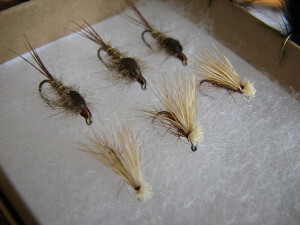 What you’ll want to do is attach the streamer as the very bottom fly and the midge above it. When fished, this gives the impression of the streamer chasing the midge through the water. And fish seem to like it. Try fishing this setup pretty much anywhere. I’ve had great luck with it in both river and lakes. The double streamer setup is a staple in the lake fisherman’s arsenal. When fish seem to be keying on stripped in woolly buggers and other streamer patterns, it can make for some fast fishing when you attach a second streamer to your line. Again, select your streamer patterns depending on the area you are fishing and your confidence is the pattern. You can try to go for the more imitative approach or go for more of an instinctual strike of an attractor type streamer. Like the streamer and midge two fly setup, I would avoid using the eye to eye two fly setup because of the odd angle it causes. There’s no real specifics on this. Just attach your two streamer flies to your leader and fish on! Don’t hesitate to fish this in rivers as well. 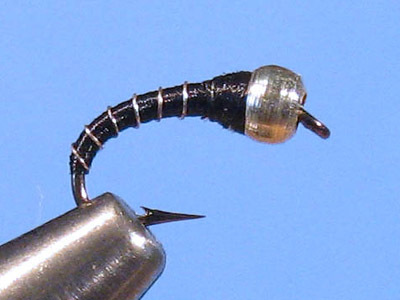 You could be surprised at how effective this two fly setup can be in those deep pools or runs. These options are what I would consider the basic options to get started fishing a two fly setup. Don’t stop there though. 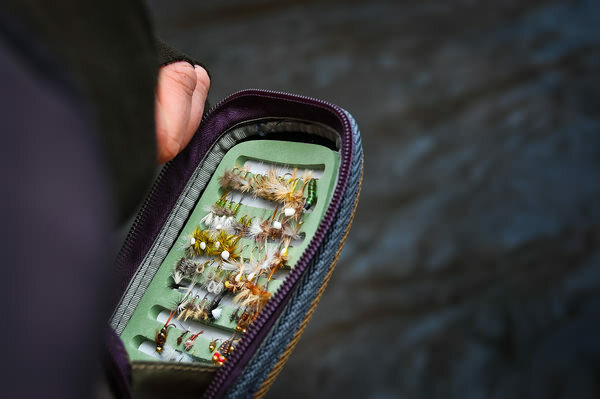 Try thinking outside the box about what patterns could work well together and the most effective method to use in order to present your flies to the fish in any given situation. Want to know what flies to attach to the end of your leader in a two fly setup? Be sure to check out the new Fly Fishing Entomology course. I’ve partnered with The Catch and The Hatch to bring you this amazing resource. 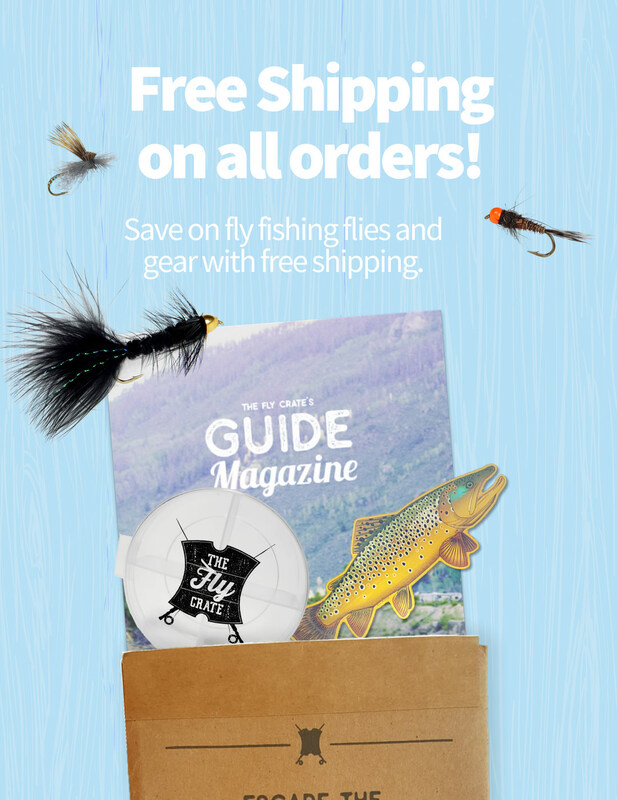 It will help you learn to identify the insects you encounter on the water and then put that knowledge to use in selecting the perfect fly to help you catch more fish. Check it out today!